Beautiful, terrifying free-fall videos… – Nerdwatch! 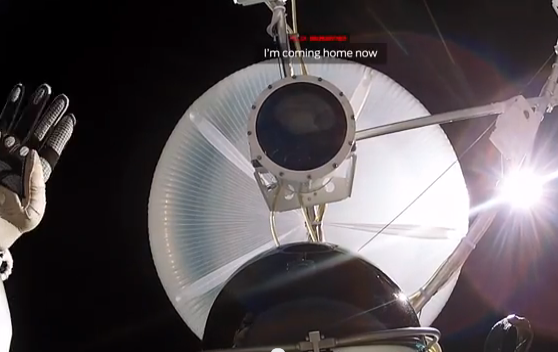 From two years ago, when Felix Baumgartner jumped out of a perfectly good, pressurized capsule at 24 miles up, and free-fell to Earth to test a pressure suit and make history as part of the Red Bull promotion, “Red Bull Stratos.” This is a compilation of videos taken from the GoPro cameras attached at various places on his suit, and just released on YouTube. Personally, I have great admiration for him, and for his predecessor, Joe Kittinger, who made a similar jump back in the 1950’s. I also would never in all of my remaining life ever do what those men did, it isn’t even on my “bucket list”! My severe acrophobia wouldn’t let me even climb the ladder to get into the capsule, much less allow me to ride it up 24 miles! This video compilation takes various views of Baumgartner’s jump, from his chest, legs, and from the outside of the capsule. GoPro cameras are amazing in how fantastically well they capture hi-definition video, and how rugged they are, and this video is definitely a beautiful, terrifying addition to their library. The addition of the ground-to-air conversation added to the excitement, especially when Baumbgartner went into a high-speed spin during part of the descent. Tagged Felix Baumbartner, free-fall, GoPro, high-altitude, Joe Kittinger, Red Bull, Stratos. Bookmark the permalink.